The Brooklyn Museum and Dartmouth University have both developed their own social metadata ‘tagging’ games for students and the general public play with. The mission of these two different games is to increase the metadata – or tags – in each of the institutions’ collections and also to create keywords by their users, in the language of their users. Both Dartmouth and The Brooklyn Museum’s metadata games are built around the visual holdings of each of the institutions collections. Dartmouth’s Alum Tag utilizes photographs of Dartmouth alumni and The Brooklyn Museum’s two games, Tag! You’re It! and Freeze Tag, are both built around photographs or scans of artwork in the museum. Tag! You’re It! works similarly to Alumni Tag, in both of these games players are given an image and are asked to write as many relevant descriptive words for each presented image as possible. 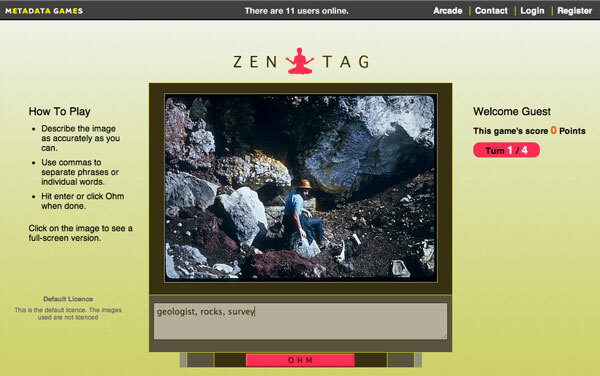 Freeze Tag, is different from the two other metadata games however, as each round prompts the player to rate ‘yes,’ ‘maybe,’ or ‘no’ for a previously suggested tag. Although metadata games can in no way replace archivists they can help to provide a necessary diversity in the language of keywords. Additionally (as discussed in a Chronicle article on Alumni Tag) players using metadata games tend to amass a large amount of tags per game (around 33 per image) and around 90% of the tags were deemed usable occurring to the game’s creator Mary Flannagan.